Albert obtained a Bachelor of Laws in 1980 and completed the Postgraduate Certificate in Laws in 1981 from the University of Hong Kong. He was awarded a Master of Laws degree in Comparative Law from Harvard University in 1982. In 1984 he was qualified to practise as a solicitor in Hong Kong. In the same year he began his academic career as a Lecturer in Law at the University of Hong Kong. Albert served as Head of the Department of Law in 1993-1996, and Dean of the Faculty of Law in 1996-2002. Albert is an Honorary Professor at the Renmin University of China, Tsinghua University, Peking University, Zhongshan University, Macau University, and the Institute of Advanced Studies in Social Sciences of Fudan University. He is also a Member of the Academic Advisory Committee of the Institute of Law of the Academia Sinica, Taipei. In additional to a successful academic career, Albert has been active in public service. He served as a Member of the Law Reform Commission of Hong Kong in 2002-2008, a Member of the Committee on Review of Post-Service Outside Work for Directorate Civil Servants in 2008-2009, and a Member of the Commission for Strategic Development of the Hong Kong Government in 2005-2012. For his contribution, the Hong Kong Government awarded him the Silver Bauhinia Star in 2010. Since 1997, Albert has been a Member of the Basic Law Committee of the Hong Kong SAR under the Standing Committee of the National People’s Congress of the People’s Republic of China (“NPCSC”). The Basic Law Committee is a powerful constitutional instrumentality which provides authoritative advice on the interpretation of the Basic Law to the NPCSC. He is also appointed as a Director of China Law Society. The China Law Society is a high power legal academy in China and it provides regular legal advice to the Central People’s Government. 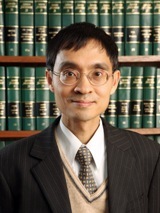 In 2015, Albert was elected Executive Director of the Chinese Judicial Studies Association, an affiliated organisation of the Supreme People’s Court.